Rare large format map of Nantucket Island. No. 12 From Monomoy and Nantucket Shoals to Muskeget Channel Mass. 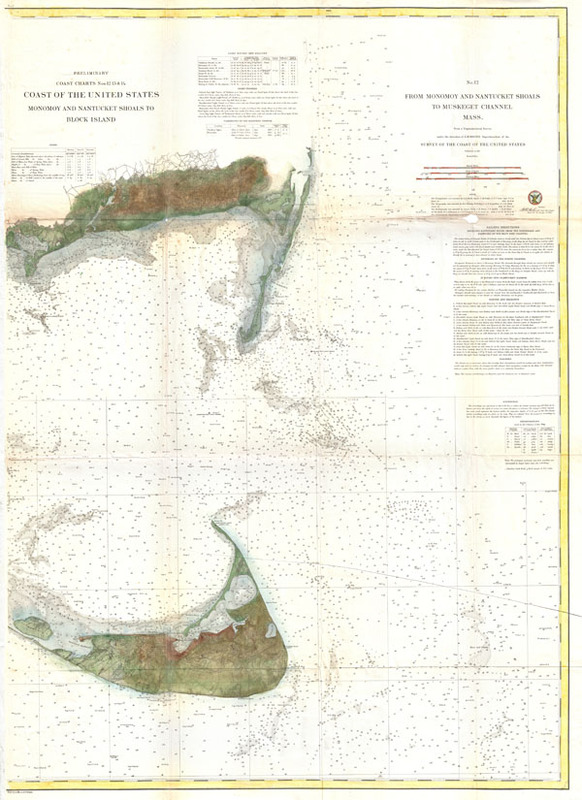 A scarce and exceptional example of the U.S. Coast Survey chart or map of Nantucket. The is the eastern sheet of a three map set - and is rarely offered separately. The this map (no. 12 in the series) covers the island of Nantucket and the southern part of Cape Cod, Massachusetts. Detailed to the level of individual buildings and roads. Offers innumerable depth sounding throughout and shows the many undersea shoals in the area. Upper right quadrant has detailed sailing instructions and notes on magnetic variations, light houses, and dangers. Title of chart in the upper right quadrant. Title for the three map series in the upper left quadrant. The triangulation and topography for this map set was accomplished by a team under the supervision of A.D. Bache, director of the U.S. Coast Survey. Engraved by A Hoen and Co. of Baltimore for the 1860 edition of the Surveyor General's Report. Report of the Superintendant of the United States Coast Survey, Washington, (1860 edition). Very good condition. Some toning, wear, and repairs along original fold lines - especially at fold intersections.